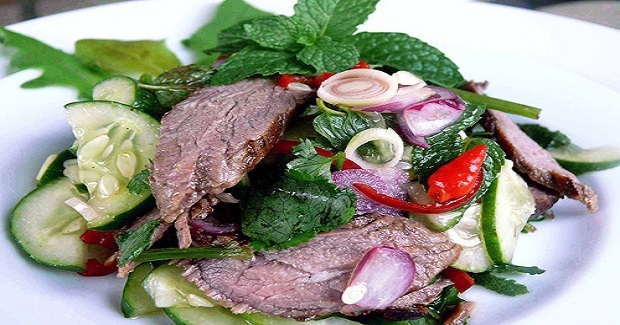 Thai Beef Salad Recipe - Gutom Na! Posted on Monday, May 16th, 2016 at 3:08 am. The beef can be prepared either by frying it until it is almost done, then cut into thin slices or it can be cut into thin slices, marinaded with 3 T cornflour and then blanched very briefly in boiling water and drained. I usually cut and blanch it because it is faster and gives a more tender and smooth bite but frying the beef gives it that char-grilled flavor and better color. Combine everything, adjust the taste by adding more fish sauce or lime juice. Chill in fridge. Good as a starter.